It's October, but it feels like Christmas. Nope. It's not the kids' Halloween costumes. That was a different box. True. But until you grow your own garlic...you've never really tasted garlic. Last year was my inaugural attempt to grow this pantry staple. I mean, honestly—I usually pay 99 cents for a three-pack of basic, white garlic bulbs. It seemed a waste of time and effort to cultivate my own organic garlic. But you know my gardening obsession. I had to try it. Oh. It was so worth it. It's a good thing that Peter and I both like garlic. Many herbalists believe garlic can cure the common cold, fight high cholesterol, serve as a natural antibiotic, and even repel mosquitos. Plus, we all know the mythology involved with garlic—vampires, be gone. Garlic, and its culinary uses, arrived with the influx of immigrants into the United States. It wasn't until our new citizens arrived that garlic became a common, well-loved fixture in the kitchen, permeating the American culture with its flavor...and scent. Honestly, could you imagine Shrimp Scampi without garlic? The beauty of garlic is that it's incredibly easy to grow. I promise. In the fall, when your garden looks tired, and you're pulling up the last of your gangly tomato plants, you can keep your garden productive with very little effort. It's also a great crop to grow if you've never gardened. You dig a hole, place a clove in the hole, cover it up, add some mulch on top, water occasionally during dry spells, and viola! By June, you'll be harvesting fresh, flavorful garlic that is so much better than the grocery store variety. Speaking of varieties...do you know how many kinds of garlic are available? First, there are a couple distinctions. Softneck garlics, which can be known as Artichoke, Italian, or Silverskin, are the most commonly grown garlics in the world. These are the garlics that you traditionally see braided and hanging in rustic farmhouse kitchens. Orphio, or hardneck garlic, derives from wild garlic. Orphio forms a circle of cloves around a single, woody stalk, while softneck varieties form cloves in a spiral layer. Hardneck varieties traditionally perform better in cold climates. Then, there's elephant garlic. Just to confuse things further--it's not a true garlic but a type of leek, with a mild flavor. Who knew? I'm overwhelmed with options. OK. Maybe it wasn't such a little bit. 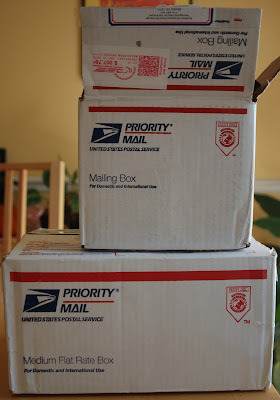 Peter rolled his eyes when he saw the boxes. Prepping the garlic is very easy but a little messy. You're simply separating (or “popping”) the cloves. Each clove will grow into an individual bulb. If you are OCD about your varieties, like I am, only prep one variety at a time so they don't get mixed. I like to separate the cloves over a big bowl to catch the papery skins, then put the cloves for each variety in a labelled paper bag. DON'T PEEL THE CLOVES. If some of the skin comes off, you can still plant the clove—but it can bruise easily, so handle gently. I considered farming out this task to the kids...until my thumbs started hurting after the second bag of garlic. I turned on some mindless TV and continued popping the cloves. By the way...do you ever find yourself watching kid TV when there are no kids in the room? I'm a little disturbed by this new habit of mine. Although “Phineas and Ferb” is brilliant, you have to admit. A raised bed for garlic is great—but honestly, I just plant it in my larger kitchen garden, which doesn't have raised beds. I like to keep the rows about three feet wide so that it's easy to plant and harvest without stepping in the bed and compacting the soil. Add organic matter, like well-composted horse manure, and make certain the soil is well tilled. In South Carolina, I use a lot of compost to prepare our soil for planting—red clay is my nemesis. Within a day or two of popping the cloves, you'll want to get them in the soil. For best production, garlic needs to be planted in the fall to give it enough time to make sizable bulbs. It's mid-October, so for me, that's my cue to plant garlic and pansies. Seeds from Italy recommends that northerners plant garlic after the first frost but 20-30 days before the ground freezes so that the garlic clove can begin to make roots. 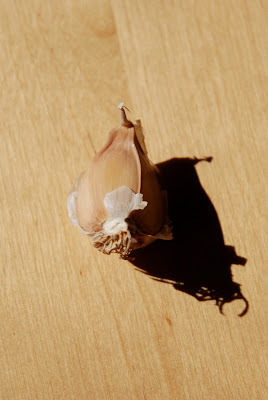 All garlic needs a period below 40 degrees to make bulbs. I'm planting a lot of garlic, so my method of choice is to dig long trenches, about three inches deep, placing one clove of garlic root-side down approximately every six inches. In each bed, though, I'm going to plant several rows of garlic, staggering the placement of the cloves to provide ample growing room. Cover with soil and water well. Oreo thinks it's really amusing to jump on my lap while I'm trying to work. Ignoring her isn't an option--she'll start kneading my leg with her claws if I don't fawn over her. Between kids and animals, it's amazing I ever get any work done. Mulch serves various purposes, depending on your climate. In the north, mulch will keep the ground moist and warm throughout the fall. In the south, it keeps the soil moist and cool. The mulch helps protect the garlic by minimizing the freezing and thawing that occurs in unprotected gardens, which can damage the garlic. Mulch also minimizes weeds. And truly...who likes pulling weeds? Well, OK. I do. On bad days when I'm annoyed, I kind of like yanking those nasty weeds out. Hibernate. Read recipes for garlic-laden Italian dishes and dream of scrumptious summer dinners. If you're having a really dry winter, make sure to water the garlic bed occasionally. In early spring, look for little shoots peeking through the mulch. As the shoots emerge and the weather warms, remove the mulch from the bed. Water during dry periods, and let the garlic continue to grow. For hardneck varieties, you will see the main shoot curl as it grows. These are known as scapes. Cut them off to make bigger bulbs, but don't throw them away—they are delicious braised in a bit of olive oil. When the lower leaves of the garlic plant begin to turn brown, it's time to harvest—which is typically in June in mild climates, July in colder areas. Carefully dig up the garlic bulbs, leaving the stalks attached, and store in a well-vented location for several weeks to allow the garlic to cure. Do not put the bulbs in direct sunlight. After curing, remove the stem (unless you plan to braid the garlic) and the outer papery layer of skin to ensure clean bulbs. Really, those garlic braids look so much better when there's not red clay attached to the bulbs. Store in a cool, dry location—and save a few of your largest bulbs for next year's planting! And there, my friends, you have it. A plethora of pungent, flavorful garlic, plus enough left over so that you won't need to purchase starter garlic again. Just remember...make sure you share the wealth with your significant other...because eating garlic alone can make for a very lonely night. Why don't you make this super easy, looks-way-more-fancy-than-it-is dinner for your honeypot tonight? (Honeypot is my new favorite word.) It's my go-to dinner, based on a recipe from my dad (who used the term "honeypot" in a letter to my mom) when I need a super quick meal that feels special. Clean shrimp and pat dry. Arrange shrimp in a single layer in a casserole dish. Do not let them overlap. In a small saucepan, melt butter. Add garlic, sea salt, and wine, stirring until warm. Remove from heat, and pour butter mixture over the shrimp in the casserole dish. Place dish in oven, and bake for 5-7 minutes, or until all shrimp is thoroughly cooked. DO NOT OVERCOOK or shrimp will be tough. Serve shrimp and garlic butter sauce over pasta, with a light grating of parmesan cheese on top. Serves two very hungry adults, one 9-year-old who will eat three shrimp, and one 5-year-old, who will eat only plain pasta with cheese. Or serves four adults with normal appetites.